Ok, maybe not EVERYTHING, but some things must go. 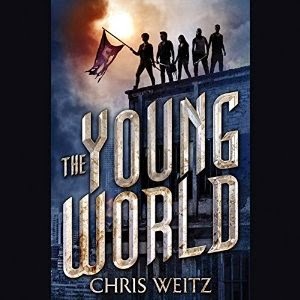 Like, for instance, seven copies of The Young World by Chris Weit! Thanks so much to Mitch, if you don't know Mitch, you should introduce yourself immediately, we have a bunch of audiobooks to give away. We're starting with seven, YES I SAID SEVEN, copies of The Young World. US only, as they're being shipped straight from Hachette Audio, and poor Mitch still needs to feed his family. Well, after the Harry Potter audiobooks, my favorite would have to be Blood Red Road. It was the audiobook that made me realize audio versions of books were actually pretty good (well, sometimes they are). My kids and I listened to the 39 Clues books on CD and LOVED them. The person who does the narration was fantastic. I haven't actually listened to a lot of audiobooks, but I love Dark Wolf by Christine Feehan on audiobook. Cruel Beauty is my favorite so far. I love audiobooks and I don't know what to pick as my favorite. I really like the multi-voice performance of one of my favorite books, The Guernsey Literary and Potato Peel Pie Society. Beauty Queens by Libba Bray. Absolutely hilariouis! I dear goodness! Favorite audiobook?!?!? SO HARD! The Demon King by Cinda Williams Chima. Or The Scorpio Races by Maggie Stiefvater. Or The Knife of Never Letting go by Patrick Ness.... you get the idea. SO MANY AUDIOBOOKS TO LOVE! My favorite audiobook is Twilight. I know, but I loved that narrator so much. I listened to the "If I Stay" duology on audiobook and loved it! I love, love, loved the Eve trilogy and want to experience this novel, too. Thanks for the stellar giveaway! !